Vibhishana was the brother of Ravana and Kumbhakarna in the Ramayana. He was the third son of Sage Vishravas and Malini. The story of Vibhishana is interesting – even though born to same parents he was diametrically opposite to Ravana. He helped Bhagavan Sri Ram in the war against Ravan because he had imbibed the good qualities of his parents – Sage Vishravas and Malini. Valmiki Ramayana Sundara Kanda (V.37) clearly shows the farsightedness and Dharma of Vibhishana. He pleads with Ravana to set Mata Sita free as soon as he finds out that She has been abducted. He already realized the greatness of Sri Ram and considered it Adharma to forcibly carry away women. It was Vibhishana who directed Hanuman to Ashoka Vatika during Bajrang Bali’s search of Mata Sita in Lanka. Again when Ravana wanted to kill Hanuman, Vibhishana reminded him about the diplomatic laws – an emissary should never be harmed. 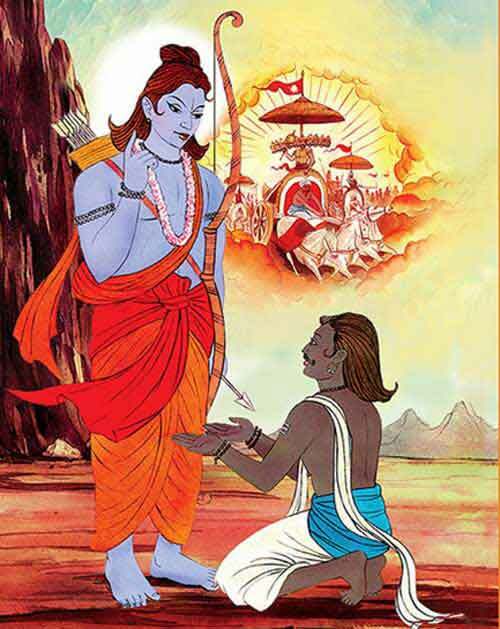 When the war in Ramayana was to start, Vibhishana asked Ravana to return Mata Sita and seek pardon from Bhagavan Sri Ram. This infuriated Ravana who threw out Vibhishana from Lanka. Vibhishana then took refuge in Bhagavan Sri Ram. Lakshman and Sugriva doubted the motives of Vibhishana but Sri Ram and Hanuman quelled all the doubts. In the battle, Vibhishana provided vital information regarding the enemy army to Sri Ram and Vanarsena. The downfall of Ravana and his son Indrajith in the battle was due to the information shared by Vibhishana. Vibhishana performed the last rites of Ravana, his brothers, Indrajith, other relatives and of the warriors that were killed in the battle. After the war Bhagavan Sri Ram coronated Vibhishana as the king of Lanka.